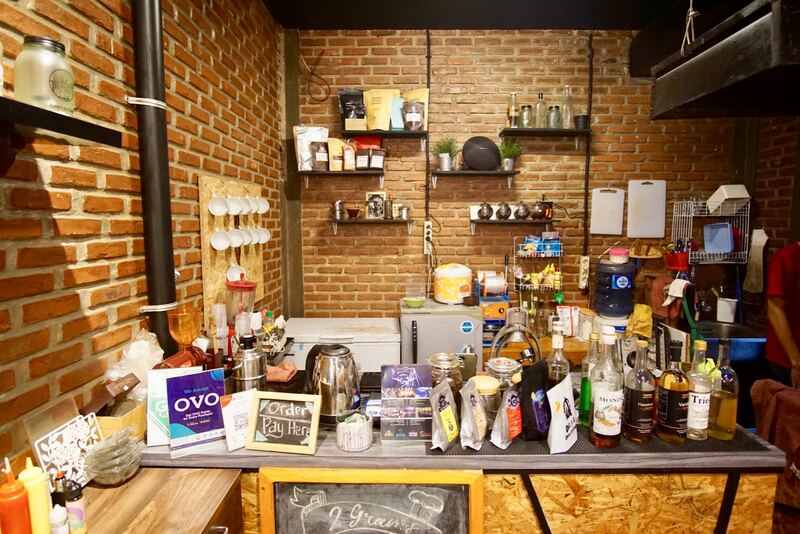 Right next door to the large and modern Kahve is the small but stylish 2 Grams Coffee & Meals. 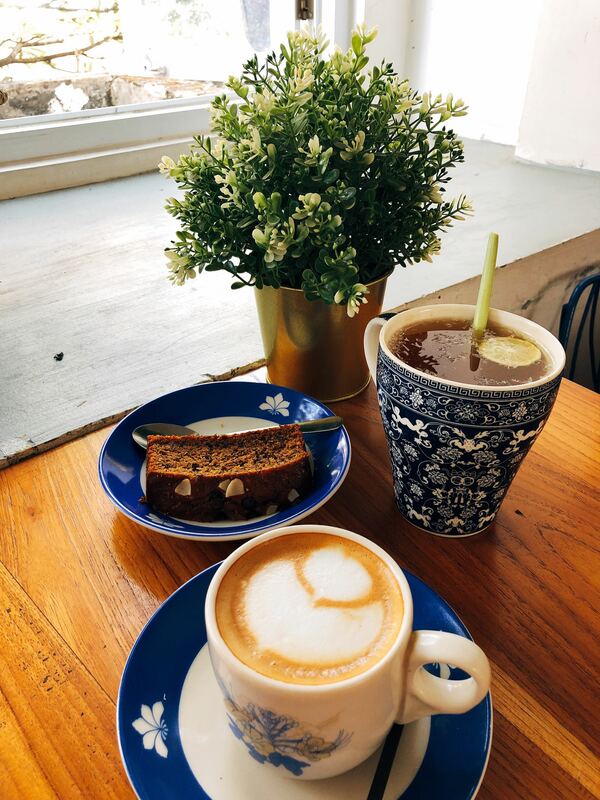 We love this place mainly because it’s small and cozy with decent WiFi and serves up pretty good coffee without an espresso machine! The first thing you notice about this place is how small it is. 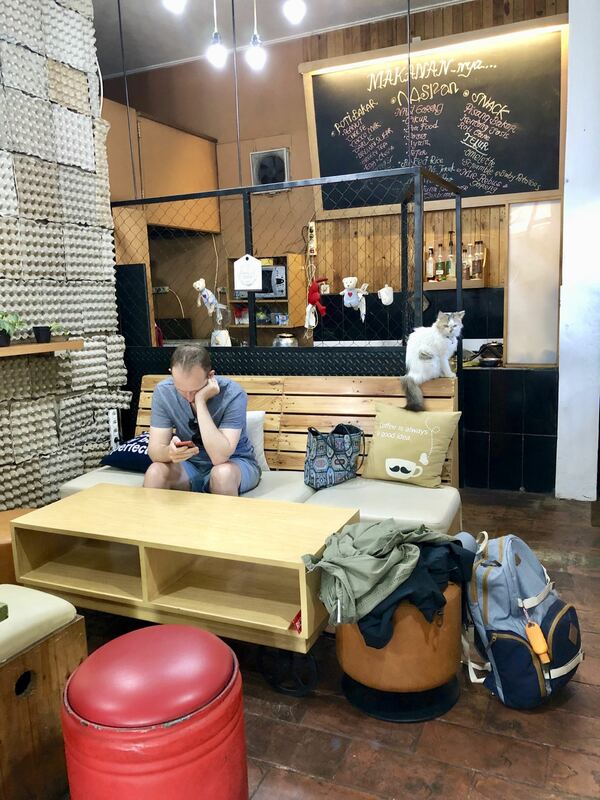 It’s smaller than the carparks of many Bandung coffee shops with space for less than 20 people in side and perhaps fewer than 10 outside. I really like the fitout with a wall full of logs, pictures on the walls and plenty of lights so you’re not constantly squinting to see stuff. Coffee here is made without an espresso machine. 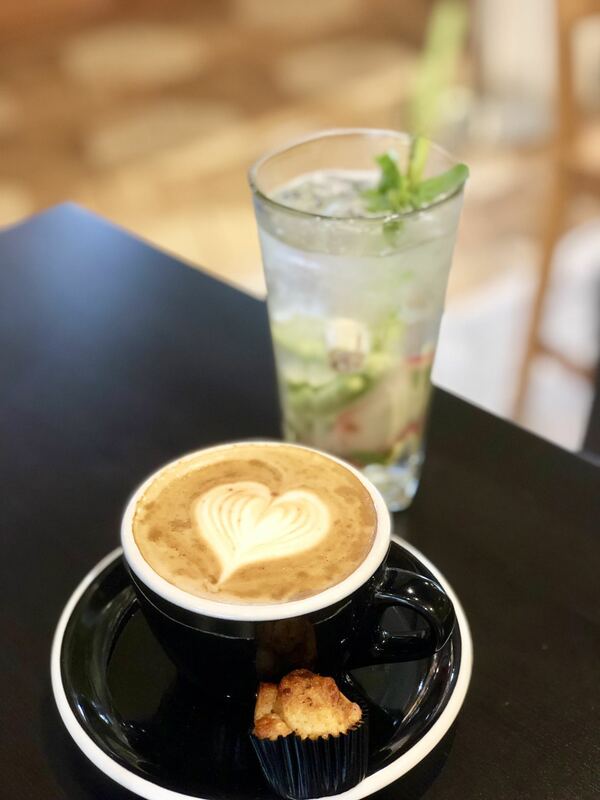 For their espresso based drinks they used a manual method of extracting shots and a small milk steamer which is heated on a stove. The coffees I’ve had in the past made using this method are usually unable to reach the standards that a machine can produce. And 2 Grams is no different. The cappuccino here is quite good, but you can tell that it’s not made on a big expensive machine. Because of that, the coffee is cheaper than at the most popular Bandung coffee shops. The menu of food seems pretty good with a selection of katsu and noodle dishes as well as snacks such as crispy mushrooms and banana nuggets. As far as working goes, it’s a decent place to do a couple of hours of work but you’re bum is going to hurt after a while as you’ve really only got a choice between short stools and benches for your seats. There are a few electricity outlets should you need them and the wifi is relatively speedy at 10mbps down and 10mbps up. 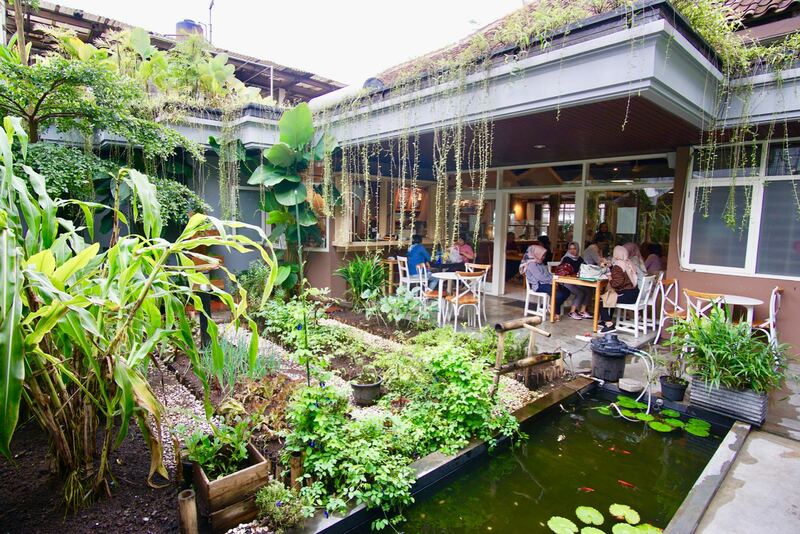 This is the type of place in Bandung that is usually quite successful because it’s not trying to appeal to the elites. It’s trying to appeal to the common man by allowing smoking inside, serving up manual coffee and not trying to be too pretentious. The prices are also good. 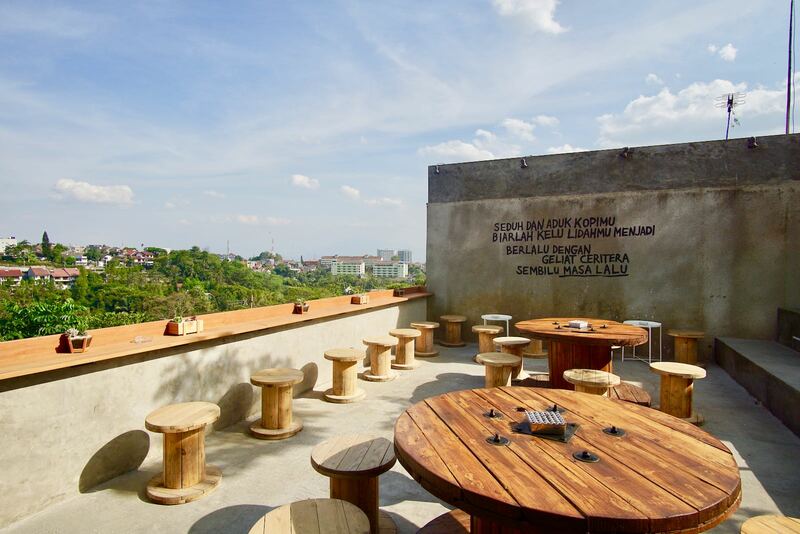 A fantastic middle of the road nongkrong spot for those trying to avoid Bandung elites. On the bottom of the receipt at Kahve are the words “good coffee, good people, good service, good place”. And all of this true at Kahve. I ordered a magic and Susan a charcoal oreo. Both of our drinks were well balanced in flavour neither being too strong or too weak. 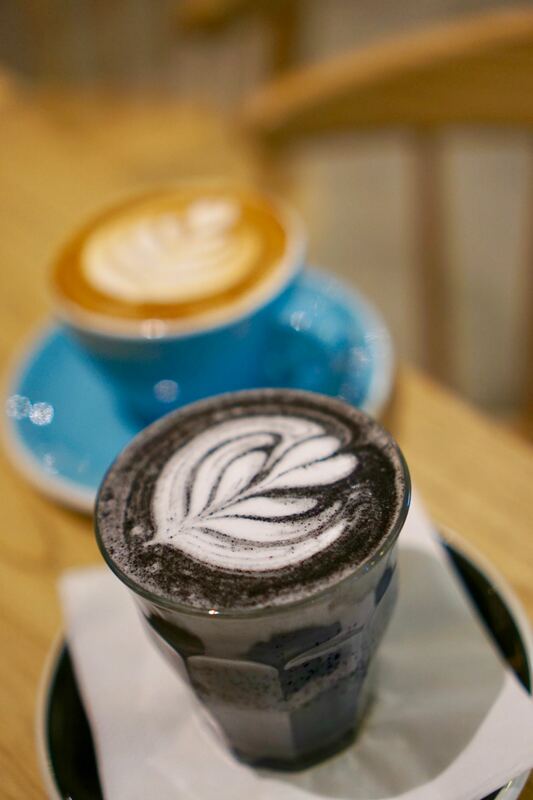 The milk on the magic was beautifully textured, silky smooth and the perfect temperature. 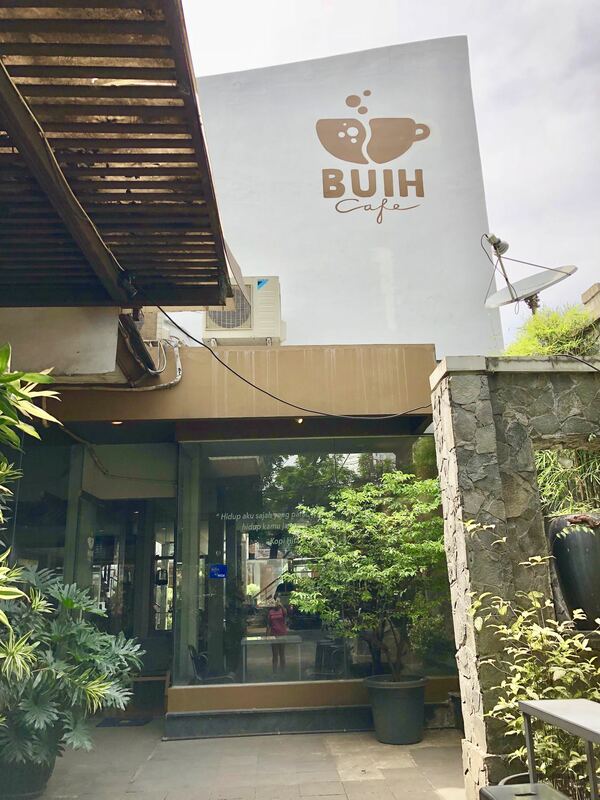 An above average coffee in Bandung. There are a few snacks on the menu such as cheese puffs, but I didn’t try these. The fitout is a little strange. When you enter, it feels a little sterile, dark and empty. It’s not that cozy. I’m not sure what they could do to improve the fitout, but at the moment it doesn’t feel right. The wifi was broken when I was there so I can confirm whether it’s a good place to work or not. But the tables are good enough to set up a laptop on and there plenty of electricity sockets should you need them. If you’ve tested the wifi here, let me know in the comments! One last point. It was extremely quiet when I was there and without more customers, I’m not sure how they are going to survive. 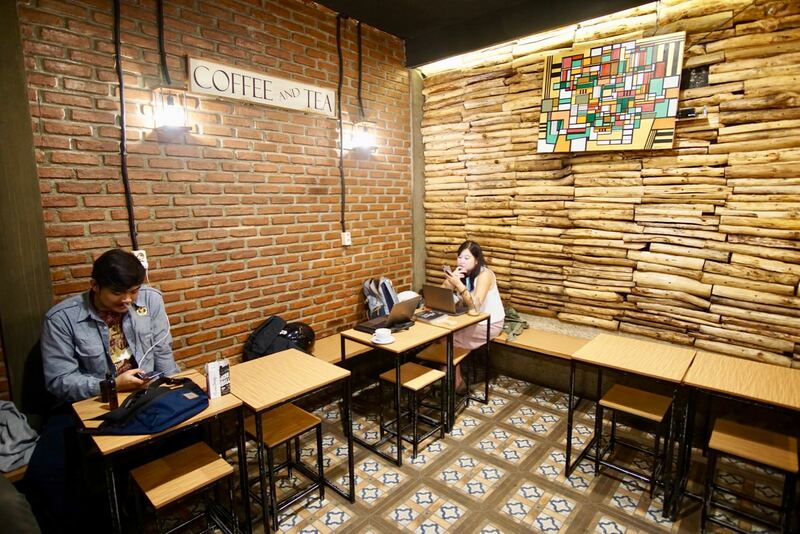 It’s the same in so many Bandung coffee shops and we just hope they can make some minor adjustments to attract more customers. Semangat! 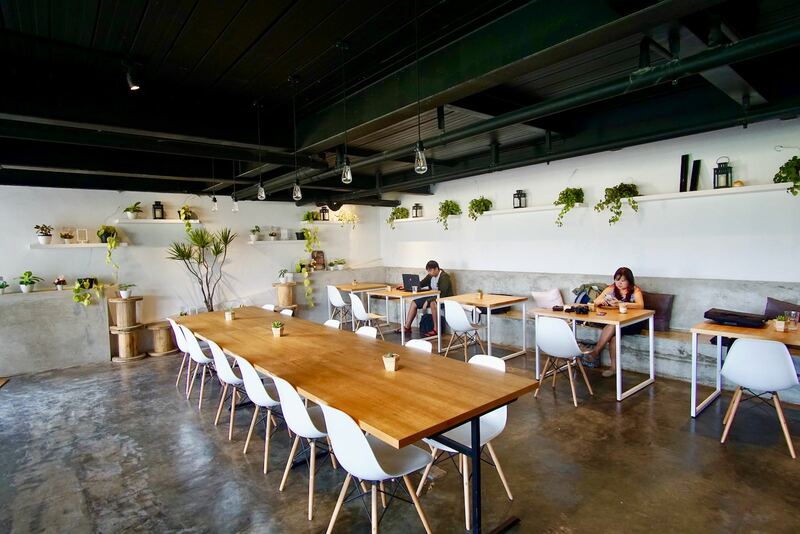 Overall, this is a place you come to for good coffee, friendly staff and perhaps to work if the wifi is operational. 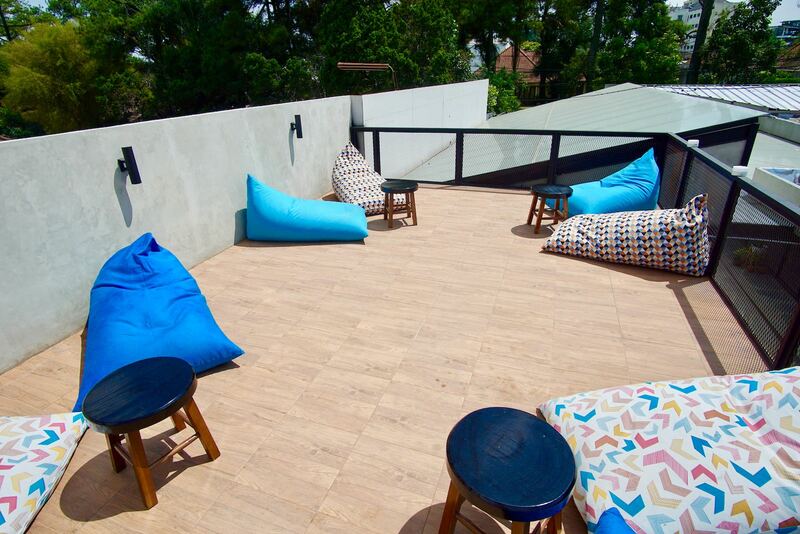 With some minor interior adjustments, this will be a mainstay on the Bandung scene. 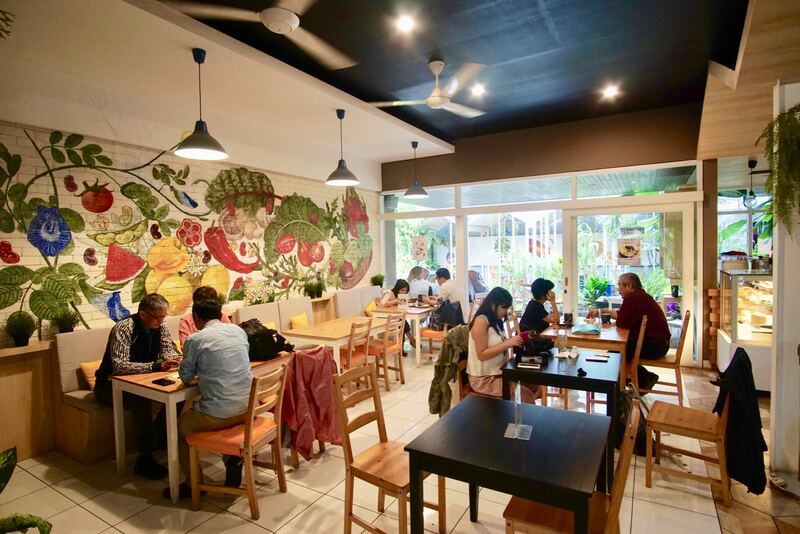 We always complain about the standard of cafe food in Bandung, so when we find a cafe doing something a little bit different to a high standard, it’s really surprising! 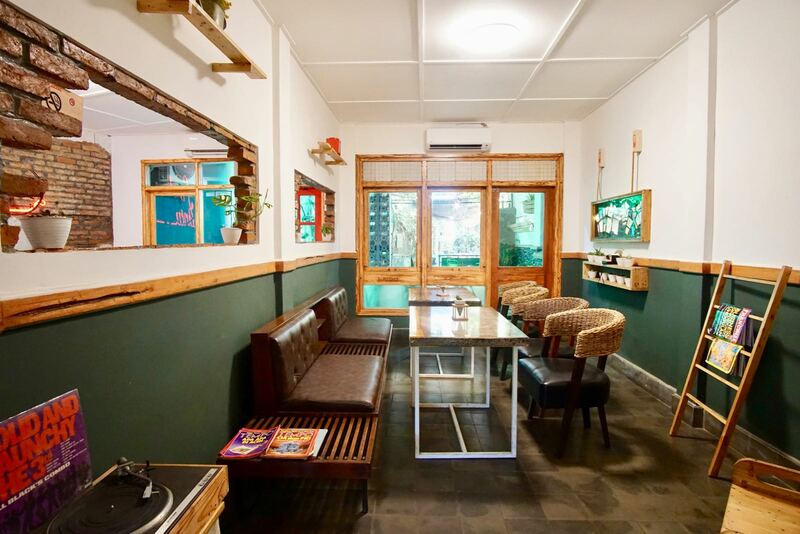 Beans and Greens is a cafe specialising in salads, bowls and veggie dishes. 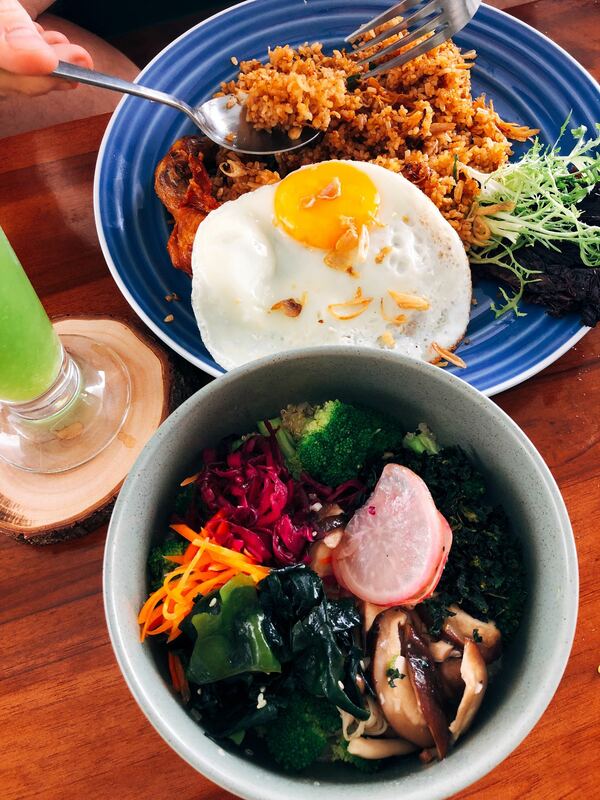 They’re not exclusively vegetarian, but a good portion of their menu is veggie-based so it’s a fantastic place to visit when you’re in need of a veggie fix after too many nasi gorengs. 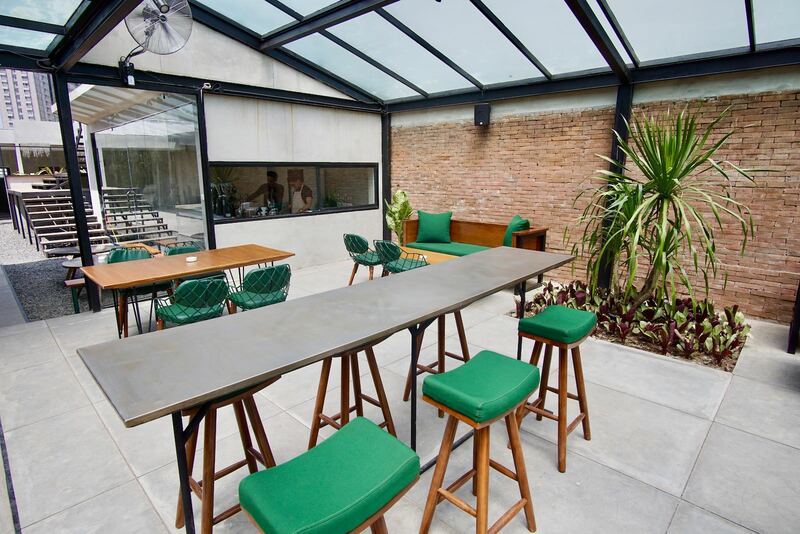 The fitout is bright and airy and out the back there is a garden area where most people choose to sit. The coffee here is quite good and definitely worth ordering if you’re coming here for a salad. But I wouldn’t go out of my way to come here for the coffee on its own. Let’s talk about the food. 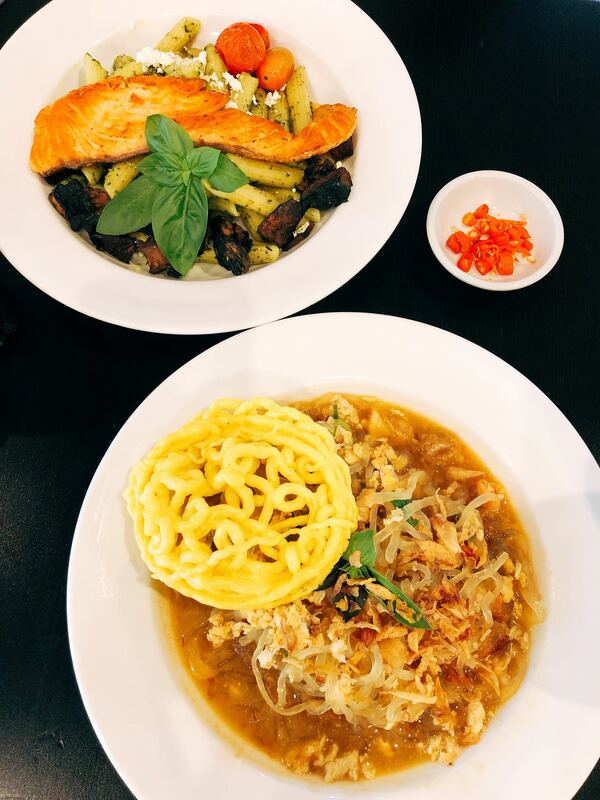 We ordered salmon penne and shirataki bakmi Jawa and both were fantastic. The bakmi Jawa replaces traditional noodles with low carb low calorie shirataki noodles which can sometimes taste a little weird, but in this dish were really good. The salmon penne was honestly just as you’d expect. A hunk of salmon on top of a bed of pesto covered penne, a few mushrooms and cherry tomatoes and a tiny amount of cheese. I thought it was excellent. 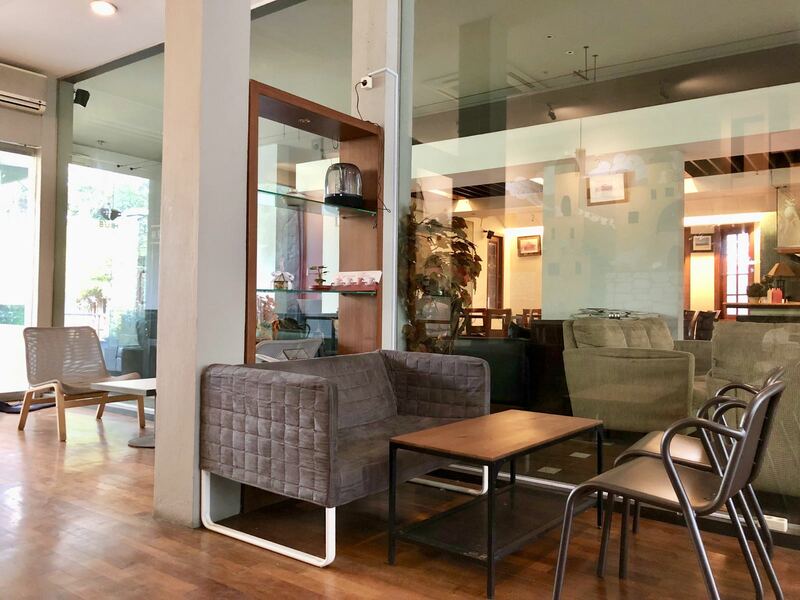 In fact, I think this cafe is one of the better new cafes on the Bandung scene despite the coffee not quite being up to standard. Hopefully next time I come here (definitely coming back), the coffee will be better. It’s possible to open a laptop here and work as many tables have electricity outlets and the wifi is quite fast at 27mbps down and 4mbps up. 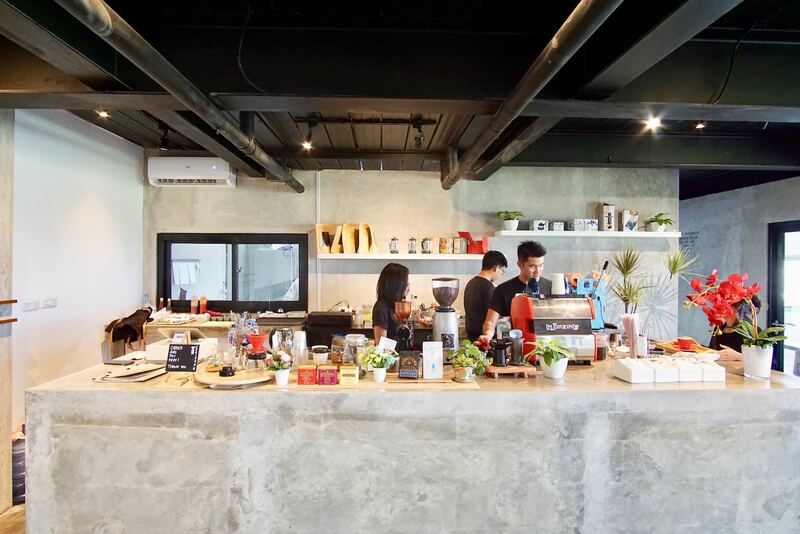 A really good new cafe on the Bandung scene. 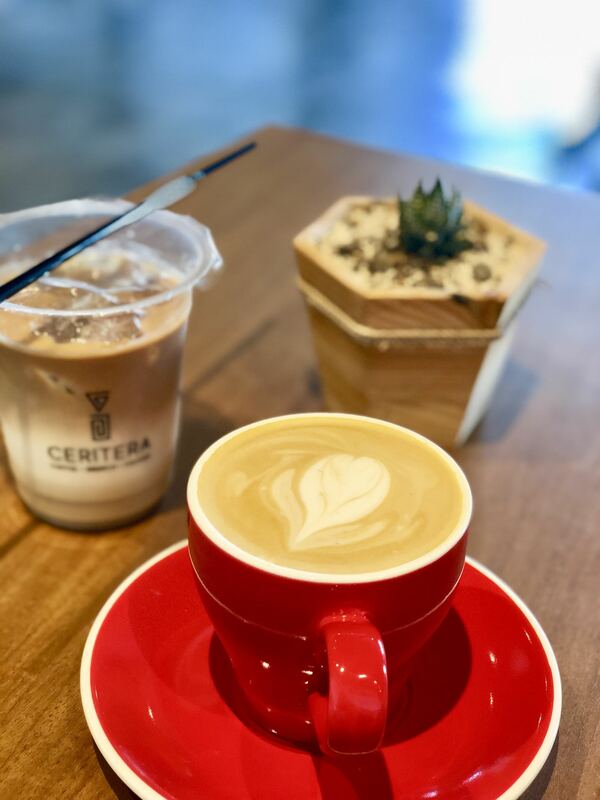 Sometimes when you visit a place you are immediately impressed by the design, fitout and aspect of the property and Ceritera is one of those. 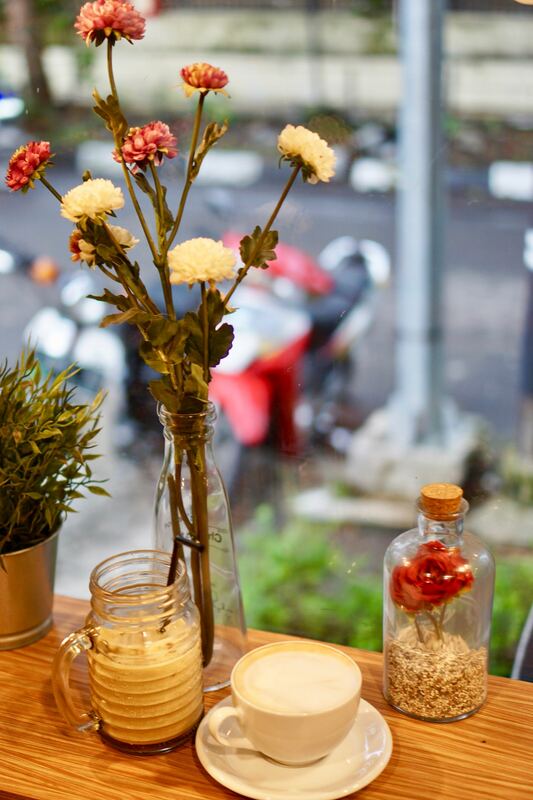 So much so that I thought this would be one of my favourite cafes in Bandung. But it’s not. Far from it. 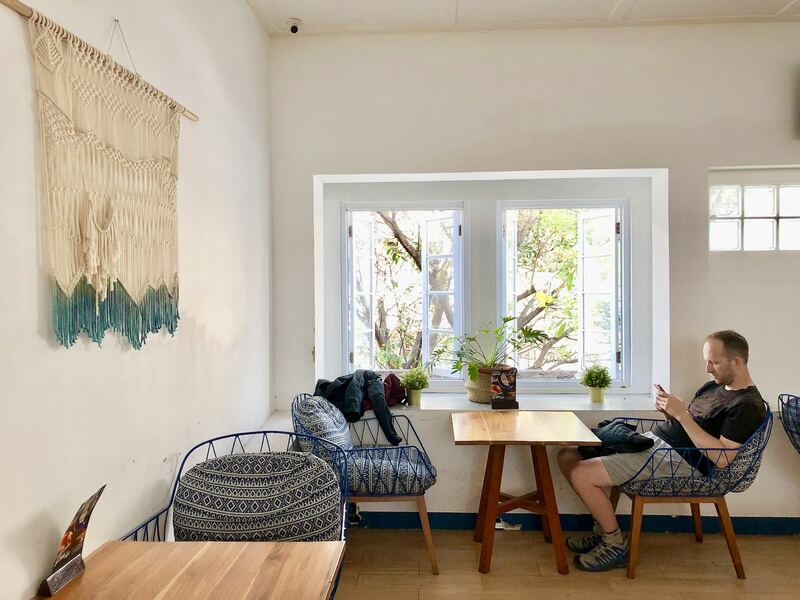 When you arrive at this cafe, you’re immediately drawn to the view — a view I first came to know when I moved to Ciumbuleuit many moons ago. And this cafe makes the most of this view with a special tiered outdoor area and a fantastic interior with balcony overlooking the valley. 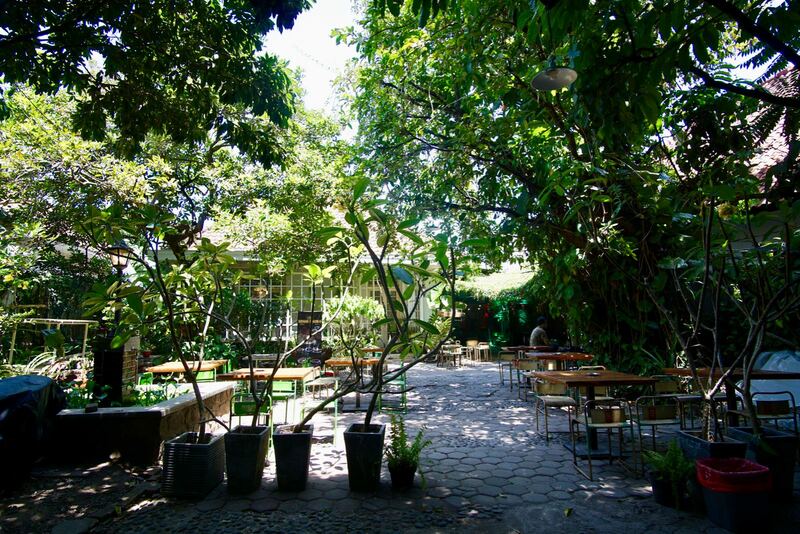 It’s brilliant and has one of the best feels of any cafe in Bandung. But there are problems. When I was there, staff were having problems with the steam coming out of the machine, but they served me up a coffee anyway and the milk was awful. Thin, watery and unpleasant. The flavour of the coffee was nice, but it was ruined by the milk. Sorry, not good enough. Susan’s iced coffee was excellent and the pisang aroma we had was quite good too. 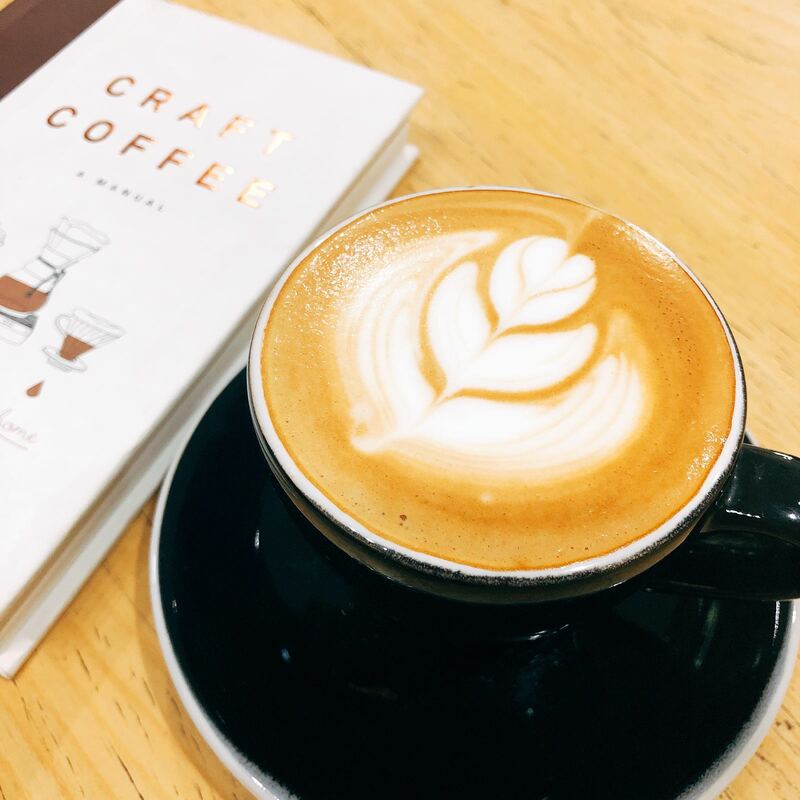 But that cappuccino… no no no. I tried to get the wifi working here, but no matter what I did, it wouldn’t connect. Susan managed to connect and got 17mbps down and 7mbps up. Definitely fast enough for work, but only if you can connect. The inside area has plenty of tables and chairs with electricity sockets, so you could easily spend a few hours here working. 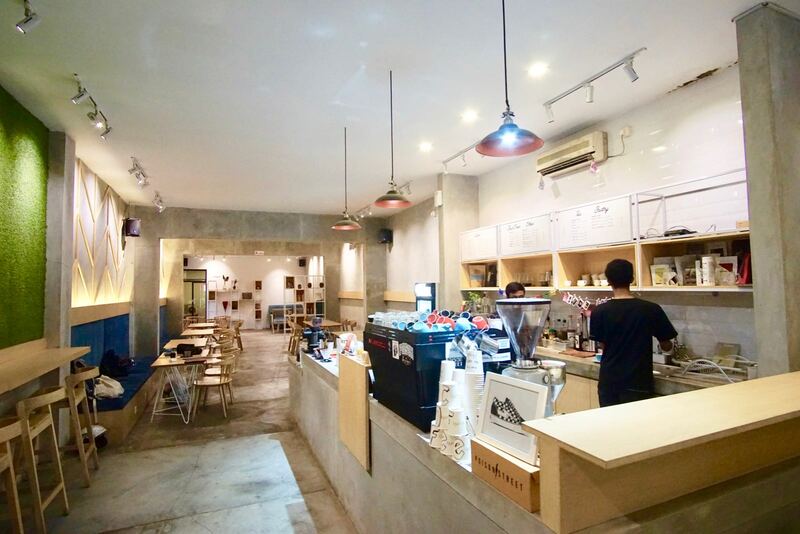 This is a cafe with plenty of potential. Great fitout in a great location. I believe they know how to serve good coffee and that I was served a bad one because they had some sort of technical problem. Next time I visit, I hope to get a good one. When you roll up to this place you’re immediately reminded of Mimiti both at its original location and more recently at its new location in Dago. Such is the design of this place with concrete and faux concrete walls, the comparisons are unavoidable. I came here during the soft opening and there were still a few rough edges and it did seem a little plain, even though they’re going for the stark, austere look. It’s nothing a few plants can’t fix and perhaps the odd piece of art. A couple of the sitting areas here are boiling hot due to the plastic canopy above them. These areas aren’t really habitable at this time due to the intense heat and reminded me a bit of a greenhouse. The friendly manager told me they were working on a solution for the heat and I’m sure they’ll have that under control by the time that you arrive. I had a cappuccino and it was served in a custom made cup of a size slightly smaller than I’d expect for a cappuccino. My coffee was excellent. Beautifully smooth, perfectly strong and the cup a pleasure to drink from. It’s right up there as one of the best in Bandung. Susan’s green drink was pleasant and both of our meals were enjoyable. A special mention to the fried chicken on my nasi goreng — it was excellent. WiFi here is fast. I clocked 25mbps down and 49mbps up, so this place is definitely a potential work spot for you. Particular if you choose one of the indoor air conditioned areas where the air is cool, electricity plentiful and tables large. If not, the outside areas also have plenty of electricity sockets. This place has loads of potential and I can see this place becoming a hit after they iron out a few of the issues that exist at this point in time. 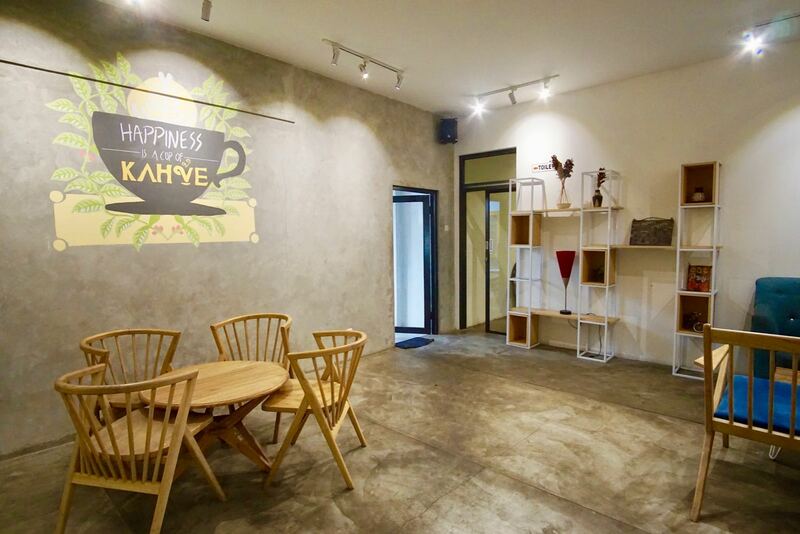 Satu Pintu, Bandung: Love This Coffee Shop! Another day, another Bandung coffee shop. Sometimes it feels like the new coffee shops in Bandung are neverending and honestly, it takes a lot to impress me these days. So when I arrived at Satu Pintu, I was expecting the same old Bandung coffee shop. But I was immediately in love with the property Satu Pintu is located on. A large old block with lots of old trees much like Bandung would have been in the old days. I love trees. The coffee shop itself is to the side of the main house and has two main sections. One large section outdoors for those who smoke and one large one indoors for those who don’t and who prefer air conditioning. The inside section feels good. Someone with an eye for design has really paid attention to so many aspects of the interior that it feels incredibly well organised, clean and finished with good quality. It’s better than the average Bandung standard and as a result, it feels good to be here. I tried the cappuccino here which apparently is stronger than their magic. That’s new for me, but I can attest to the fact that the cappuccino is super strong. I loved it. 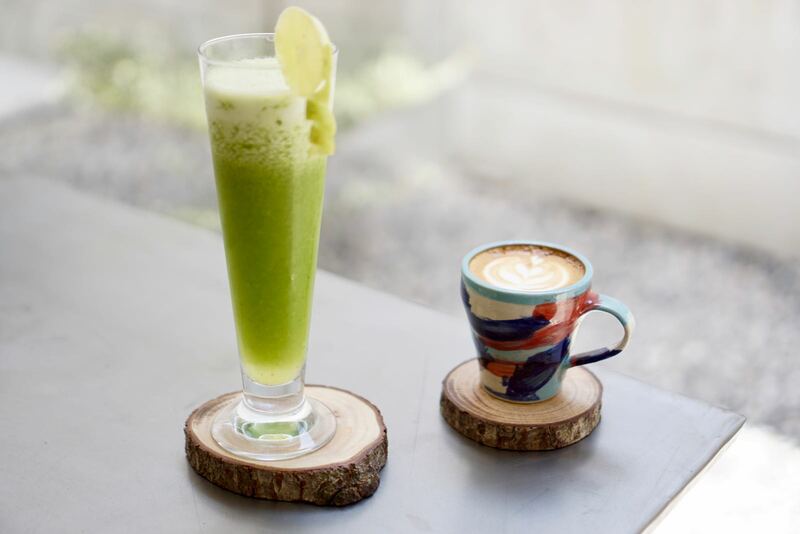 Susan had the iced matcha latte and it has a particular flavour to it that made it more enjoyable than the average matcha latte. WiFi here is fast at 39mbps down and 7mbps up and there are plenty of places to sit and work as well as plug in. A good place to work. 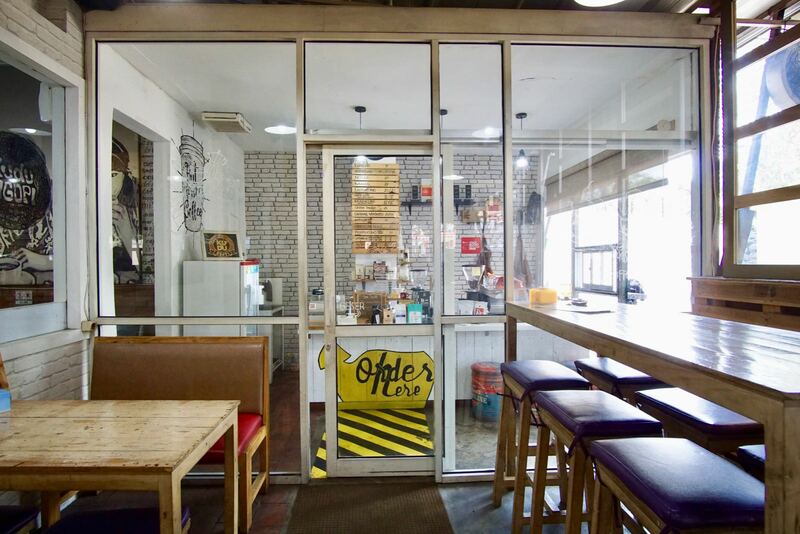 After visiting more than 80 coffee shops in Bandung over the past few years, this is now one of our favourites. Love it. 3. What is a Vignette? 7. What is the Cost of Petrol/Gas in the Balkans? 8. How Much Does it Cost to Rent a Car in the Balkans? What an adventure. 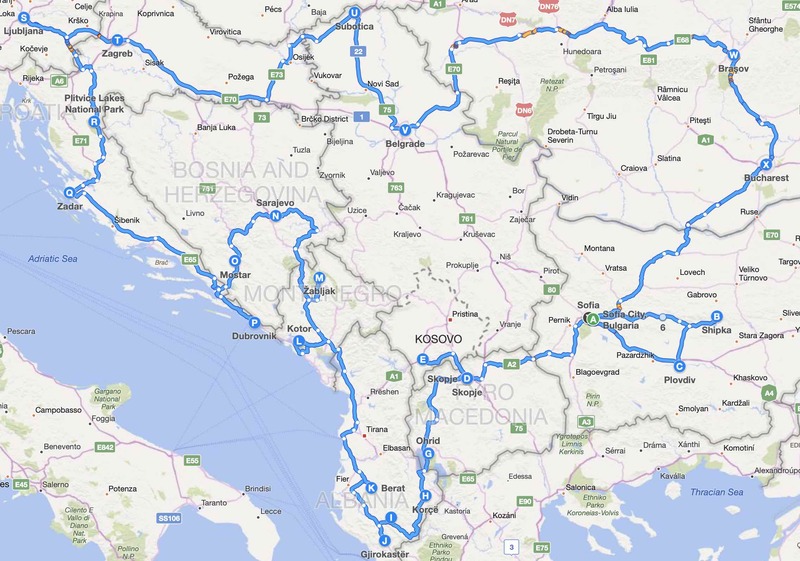 My recent road trip around the Balkans for 39 days in a hire car was one of my best yet! Lots of things to see and do, reasonable roads and not a single hassle when it came to crossing borders or the reliability of the car itself. Here’s how it went down. I picked up the car in Sofia, Bulgaria and drove through Macedonia, Kosovo, Albania, Montenegro, Bosnia & Herzegovina, Croatia, Slovenia, Serbia and Romania and returned the car back to Sofia. There were reasons for where I picked the car up from, where I dropped it off and the route I took which I’ll explain later on. Some of the things I want to talk about are the vignette, border crossings, driving on snow and ice, insurance, tolls, where to park in cities and much much more. Needless to say, it was a totally new experience for me and there was lots to learn. The main issue when choosing a rental company is making sure that you are allowed to take the car to all the countries you want to visit. Most rental car companies don’t allow this and many others don’t allow you to visit some specific countries. You can check all the major rental car companies yourself or you can take it from me — Val & Kar in Sofia are the best company to use based on them allowing you take the car anywhere, the quality of the cars they hire and the customer service. Even though you might be allowed to take your rental car into a particular country, you also need to make sure that your rental car company takes care of all the appropriate documents such as insurance. Val & Kar do take care of these documents and I cannot talk highly enough of them. Better still, they are able to offer special deals to you if you contact them directly by email. Crossing borders is the thing that most people get worried about when they’re hiring a car. But it’s something that you really don’t need to worry about if you have a rental car company who has sorted everything out in advance. Val & Kar gave me a little booklet with all the car’s papers in it before departing and at every border crossing, I simply handed this booklet to the border officer with my passport and it was processed within about 5 minutes. 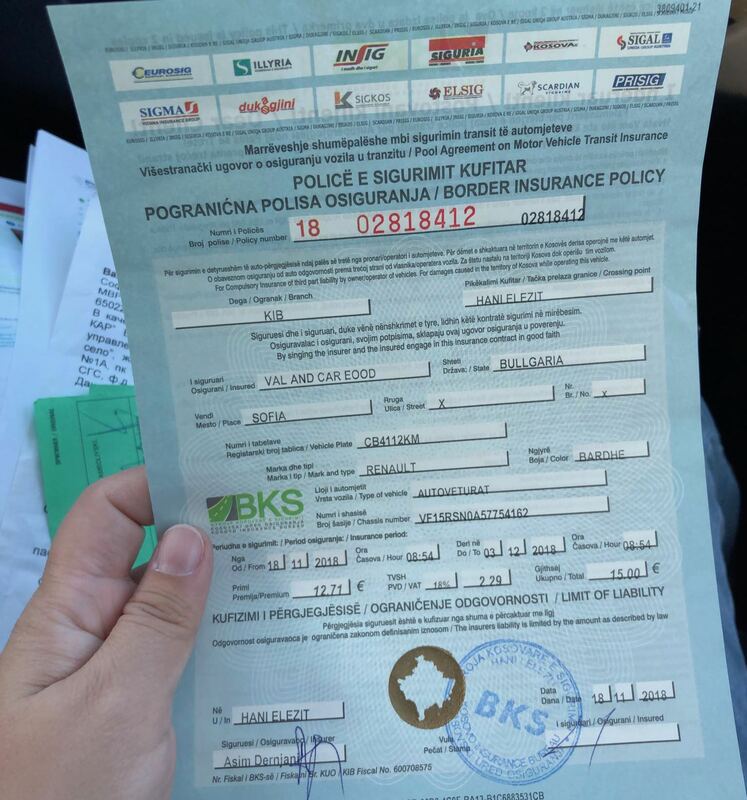 There was an exception to this — when entering Kosovo, you need to pay additional insurance which from memory was €15 for a week. 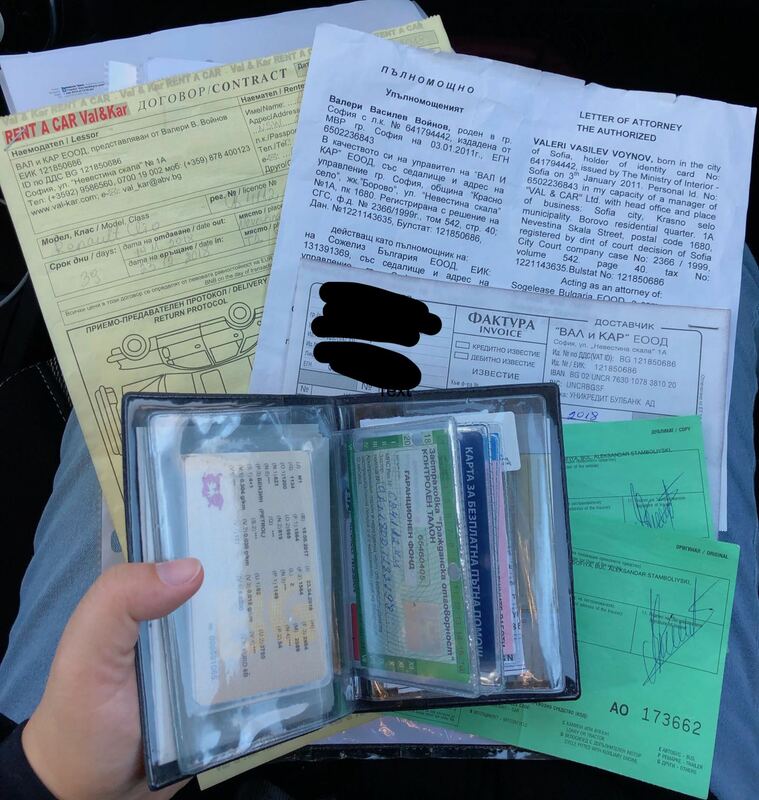 The way to do this is to arrive at the Kosovo border, present your documents and the officer will tell you to walk back about 100m to the small hut where you can buy insurance. Return to the window, show the officer and you will be on your way. I had no idea what a vignette was until I was already in the 8th country of my trip even though I’d seen signs with the word “VIGNETTE” before in Bulgaria. In short, a vignette is a method of paying for toll roads. In many countries outside of the balkans you can buy little tags which attach to your windscreen which beep when you pass a toll barrier. In the Balkans, they either use a vignette or you pay cash. With Val & Kar, the vignette for Bulgaria is already attached to the car so you don’t need to buy one separately. But when you enter Slovenia, you do need to a vignette. And because when you enter Slovenia you might be on a motorway, you’re going to need to stop soon after entering to buy a vignette. A word of warning though… IT IS NOT CLEAR FROM THE SIGNS THAT YOU NEED A VIGNETTE. When I reached the first toll barrier, there was no place to pay cash but it was definitely a toll barrier. It was at this point that I knew I needed to figure out how to pay. So I had my wife google it and the results all started talking about the vignette. And then it became clear that you need to pull off at the nearest petrol station/rest area and purchase the vignette. The process is very easy and you just attach it to your windscreen. These vignettes are available for different periods of time and cost different amounts. 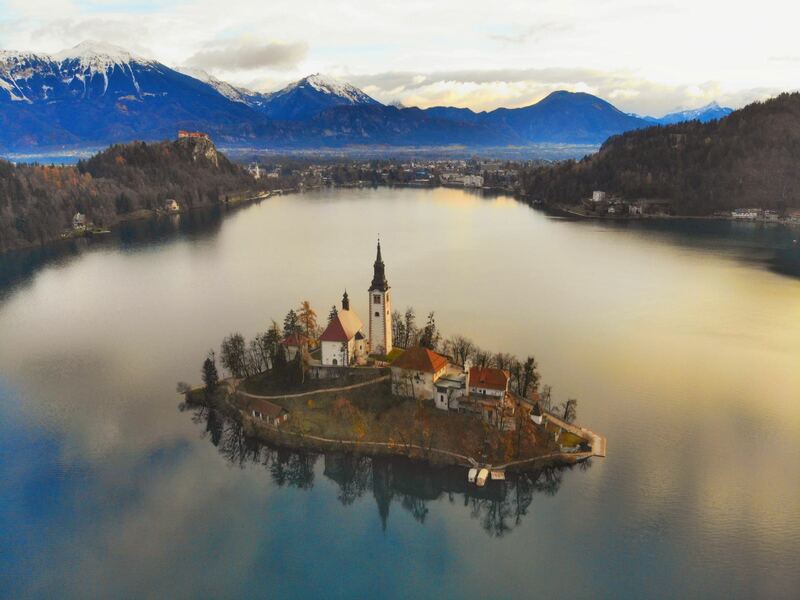 Just tell the person serving you the length of time you will be in Slovenia and they will sell you the appropriate vignette. 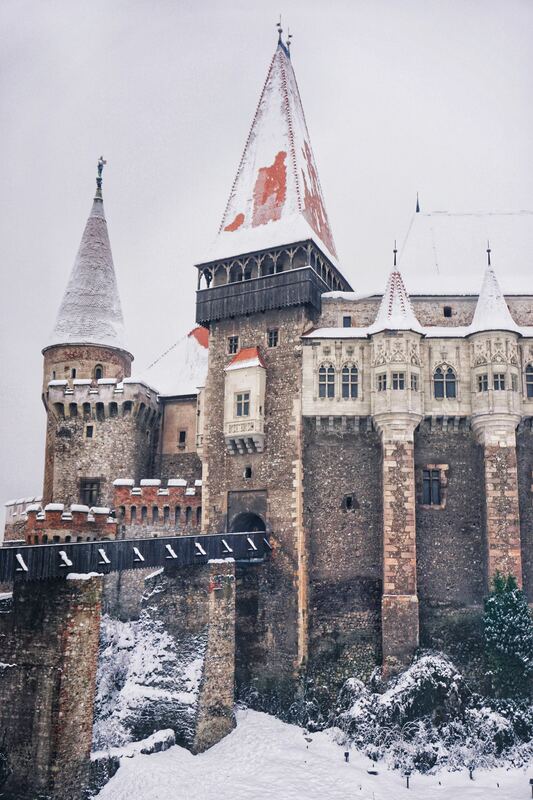 I also had to purchase something like this when I entered Romania from memory. Or was that insurance? I don’t know. But I wasn’t allowed to enter the country without paying! Whatever the case, if there is a sign saying something like Vignette, make sure you google the rules for the particular country you’re in or you could be in for a rude shock when you try to exit the country (ie they will issue you a fine). There aren’t a lot of toll roads in the Balkans, but there are enough that you’re going to need to figure out how to operate them. Each country has a different system — some charging you one fee based on the distance you travelled, some charging you a flat fee every 10km or so at a physical booth and then there’s the vignette system described above. Payment is always in the local currency, but some countries allow you to pay in Euros at a poor exchange rate. Some also allow you to pay via credit card which is the easiest method. 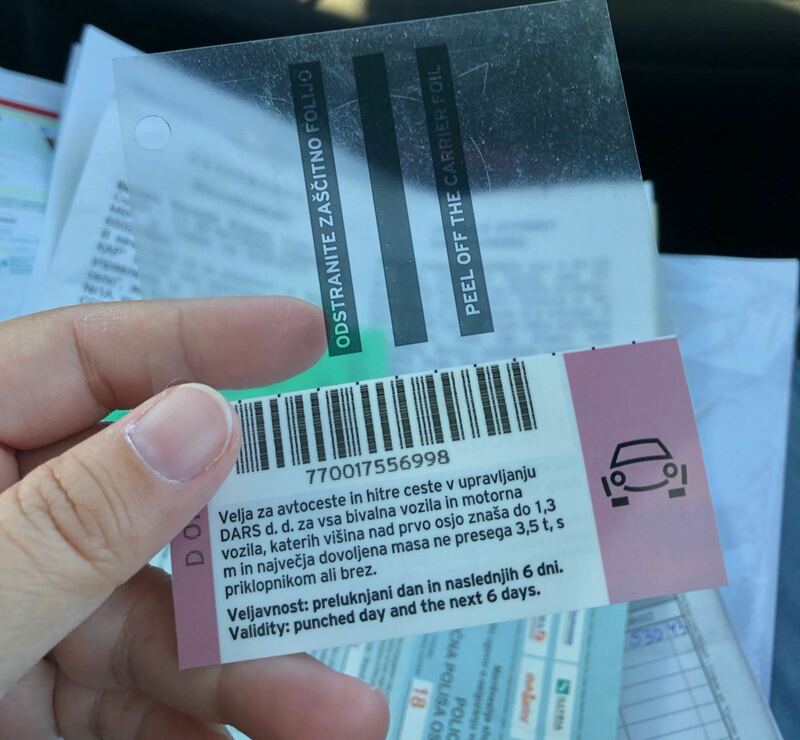 The most expensive toll road was in Croatia — €25 from memory for one of my trips! It’s expensive, but the alternative is a slow road. The more modern the country, the more likely you are to encounter a toll road, so you’ll see plenty in Croatia and very few in Albania. This impacts dramatically how fast you will travel from place to place — Albania extremely slow, Croatia really fast. 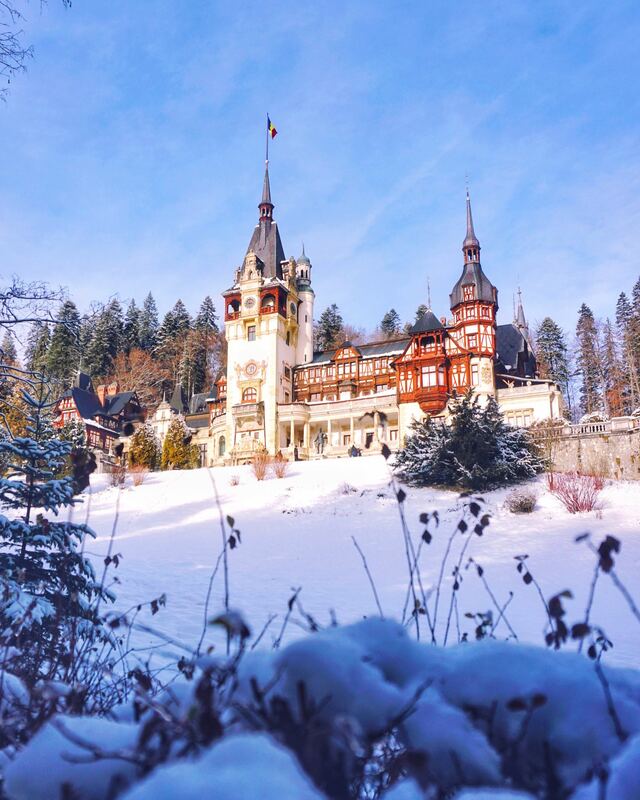 Winter in the Balkans can be brutally cold. We travelled between mid-November and late December, so we didn’t get the coldest part of the winter. But it was still very cold in some places and this needs to be taken into consideration when choosing a car hire company. Cars require winter tyres in winter with the dates of the this requirement taking effect differing between countries. Make sure you specify that you need to have your car winterised if you think you’ll be driving in cold conditions. 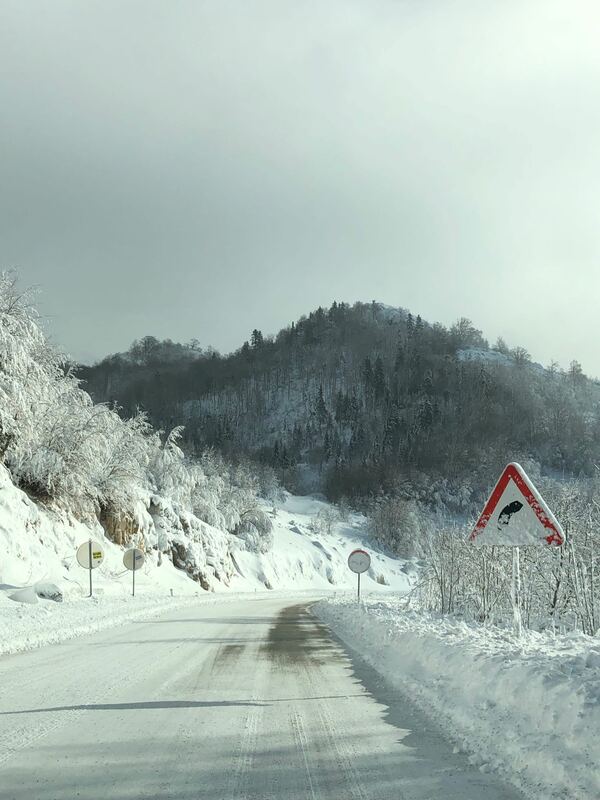 The coldest I experienced driving in the Balkans was -11ºC on the ice in the mountains of Montenegro. 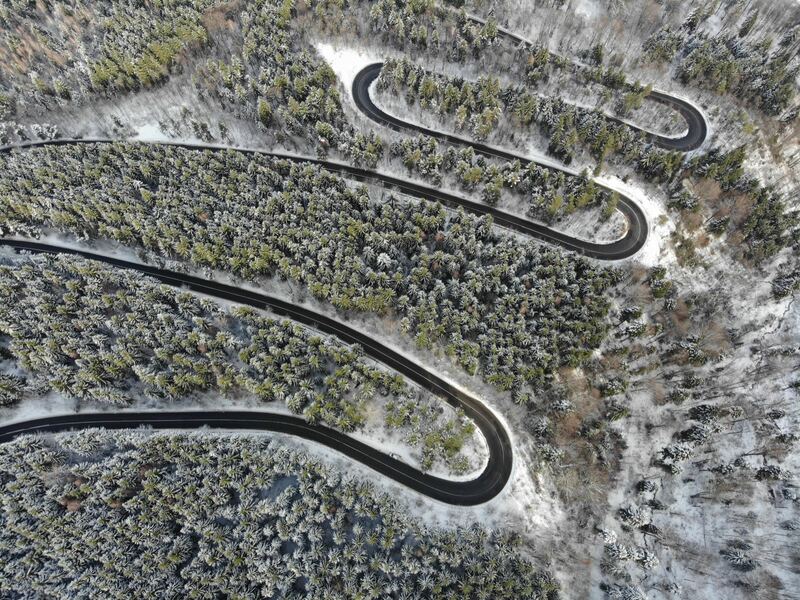 The car handled the road beautifully and it was only slippery in a few locations. Most of the time I was doing around 60km/h. Not being experienced with driving in snow and ice, I feared the snow. But as it turned out, I drove through a lot of snow during this trip including uphill sections where you had to spin the wheels all the way up the hill to get to the top. 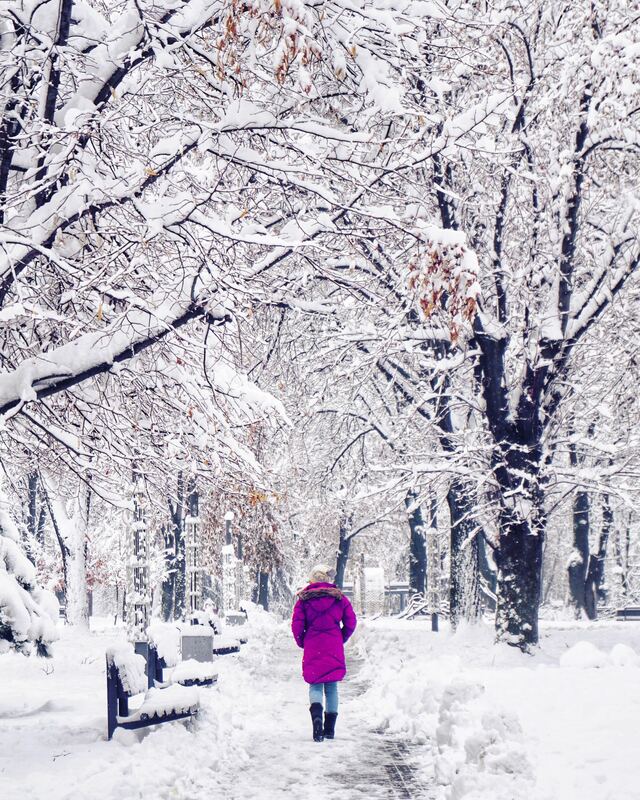 The worst snow we encountered was about 30-40cm which fell in about 24 hours in Belgrade. Needless to say, it took a good half an hour to clear the roof and dig the car out without a shovel. So if I can drive in the snow and ice, so can you. Don’t be scared if you’re an inexperienced snow driver — just make sure you have that car winterised before departure, keep an eye on the weather forecasts and take it slow. This was one of my main worries prior to embarking on this road trip. Where an earth was I going to park in a big city like Belgrade or a tourist town like Dubrovnik? And it’s a valid question because parking regulations in this part of the world can be quite strict. The first point to note is that I did this trip in winter which is also the low season. There was almost no tourist traffic. Your luck will vary depending on the season you travel in. Still, parking was a pain in some cities and this is how I handled it. I used booking.com for almost all of my accommodation in the Balkans and I selected the accommodation based on location and whether they had free parking or not. This was more difficult than it should be because there is no “free parking” filter on booking.com — just a “parking” filter. So first of all I would make sure there was parking available and then I would check each individual listing to see if the word “free” was specified anywhere. I would also search for the word “parking” in the comments to see what other guests had said about the parking situation. I never paid for overnight parking, but it did mean I stayed maybe a kilometre or 2 from the centre of the cities. No problem, I like walking. Here are all the cities where I think it’s absolutely necessary to worry about parking and where I ended up staying — maybe you can stay there too because you now know it has a good parking situation! What is the Cost of Petrol/Gas in the Balkans? While the cost of petrol varies from country to country, I paid between $1.15 and $1.45 per litre or about $4.60 to $5.80 per gallon. I was also told I needed to use 95 RON fuel. Usually this was paid for with credit card, but some petrol stations accepted cash only! Best to have some spare cash when you’re ready to fuel up. How Much Does it Cost to Rent a Car in the Balkans? The company you use is really going to determine how much you pay for you rental car, but a number of other factors are important as well. How old are the cars the company uses, what season are you renting the car in and what insurances are included. I don’t usually get the added insurance that is sold with rental cars because I don’t think it’s worth it, but I got a good deal with Val & Kar where they added the insurance into the rental price for free. 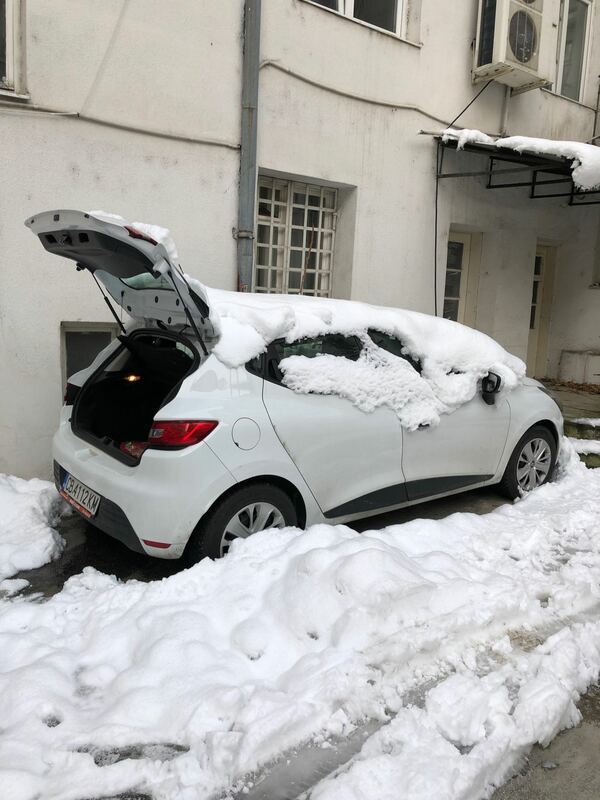 For 39 days of hire, I paid €939 which included Winter Services Fees, Roadside Assistance, out of hours drop off at Sofia Airport and Super Cover Insurance + Theft Coverage. I thought it was a good deal for the sort of trip I was going on. I did find a cheaper company than this, but the cars seemed old and I heard some bad stories. So I went with Val & Kar and I am glad I did. Everything was perfect. 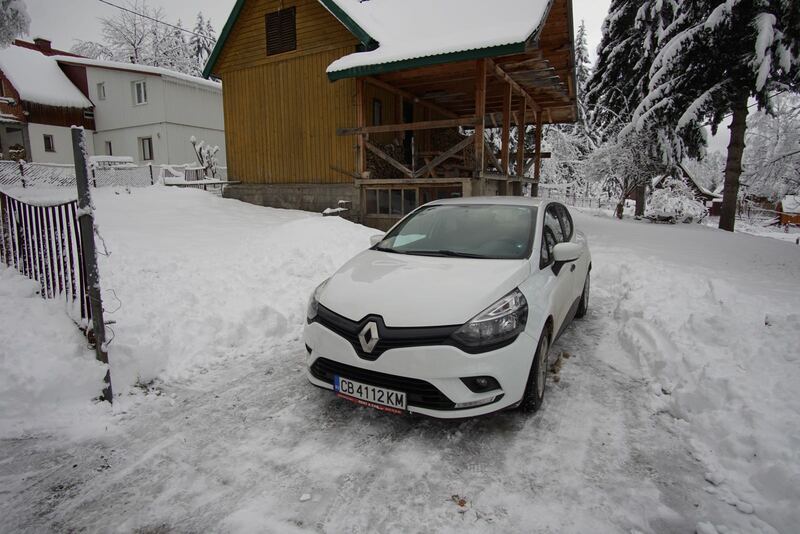 As you can see, while there are a lot of issues that need to be addressed before renting a car for a Balkans road trip, these issues aren’t too difficult to resolve. 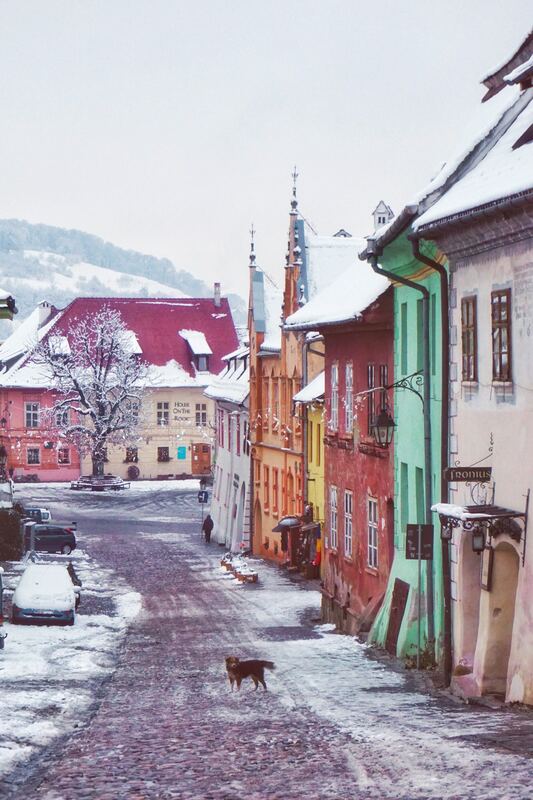 What’s more, you’ll be one of very few people who get around the region this way meaning you’ll have a much less touristy experience and have the flexibility to go where you want, when you want. We highly recommend hiring a car in the Balkans! So what are you waiting for? 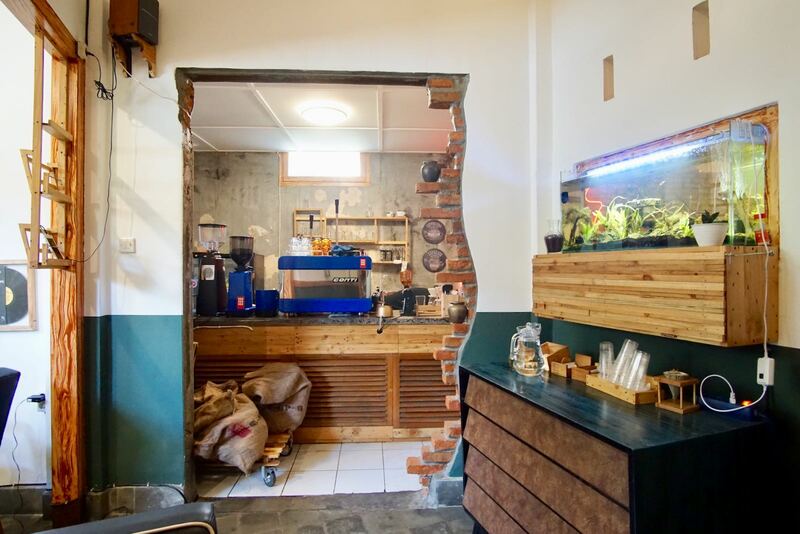 Kudu Ngopi is a small tempat ngopi in Bandung which serves up great speciality coffee from a small La Marzocco. The coffee here is really good and definitely in line with what I expect these days in Bandung. Strong, silky smooth and definitely gives you a jolt of caffeine. They also do some good here, but it’s a pretty comprehensive menu of simple foods which are good for either a snack or full meal. They’re not going to win any restaurant awards here, but I’m sure the food will fill a hole nonetheless. The fitout is pretty simple and they do a good job with the limited space they have. A bunch of couches, stools and chairs all clustered together give the place an intimate vibe, but I could imagine it getting quite noisy when it’s full. WiFi here is bad. So bad that you may not even be able to use it. When I was here it was running at 0.13mbps down and 0.27mbps up which is basically unusable unless you are absolute desperate. With that in mind, don’t come here to work until they get a better internet connection. All in all a good cafe serving delicious coffee at a good price. 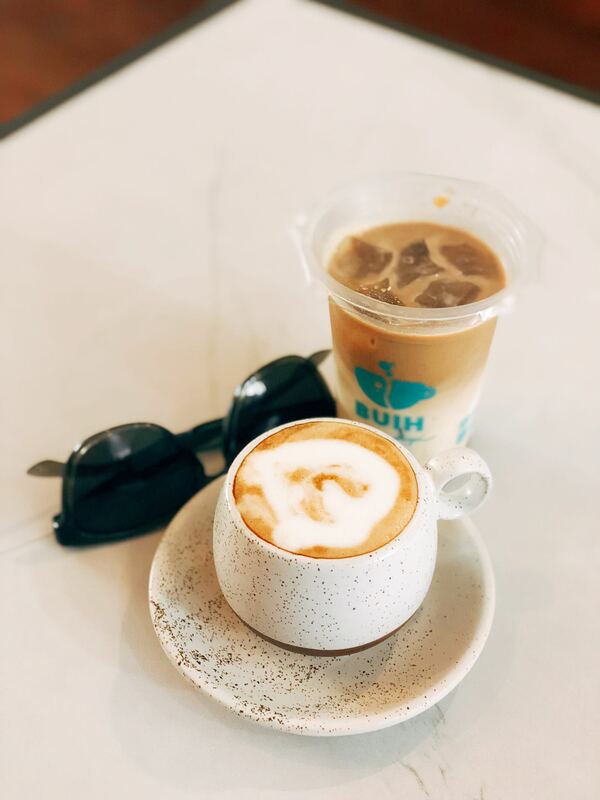 In a city that has hundreds of great coffee shops, it’s imperative that if you’re opening a coffee shop you get the coffee right. It has to be world standard. And right off the bat, a Warung Kopi Limarasa disappoints. My cappuccino was one dimensional, served in a kopitiam style cup and lacked depth. With a good coffee machine out the front, I had expected much better. I arrived here at just after 8 and there weren’t any other customers. So the staff were playing up a bit and shouting and laughing with each other in a playful, yet unprofessional way. It irked me. I had a slice of banana bread which was very good, but I didn’t get a chance to try any of the heavy meals as we were told they weren’t available (probably because it was too early). Wifi clocks in at 16mbps down and 3mbps up. I can imagine this slows to a crawl in a full cafe, so you’ll have to make up your own mind as to whether you want to work here. 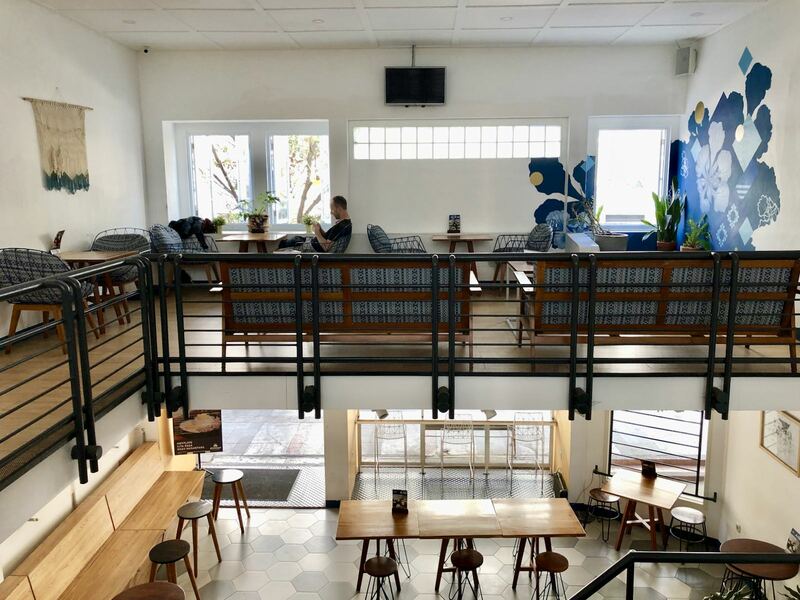 But with so many great cafes in Bandung, I suggest having a look somewhere else first before deciding to set up a laptop here. 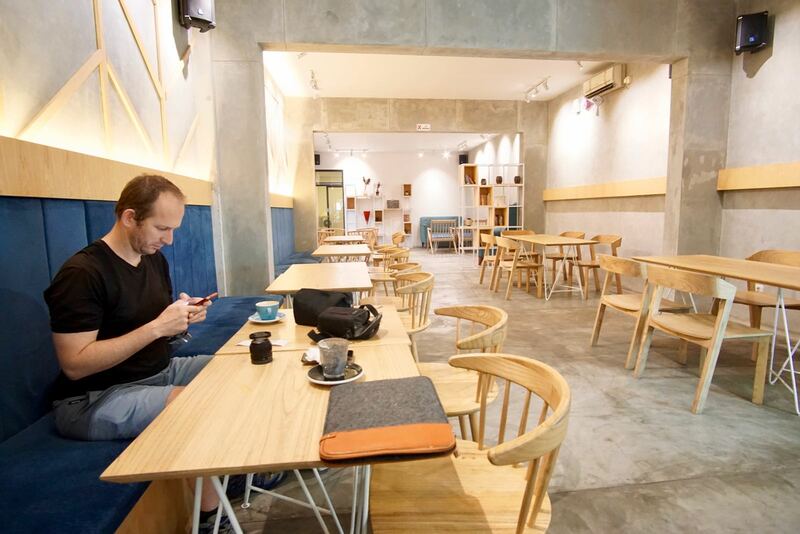 For me, this is a disappointing coffee shop when compared to Bandung coffee shop standard in 2018. One saving grace is that it’s on the cheap side at Rp20.000 for a cappuccino. I’ve seen the name of this cafe around a bit recently and decided to stop by and see what the fuss is about. And I’m still wondering what all the fuss is about. I had a cappuccino and the milk was boiled… it was so hot that it was undrinkable for about 15 minutes. Needless to say, it wasn’t a good coffee. Susan had an iced coffee buih and that tasted quite good and perhaps that is what the fuss is about. Or perhaps people love the prices here because it is very cheap. 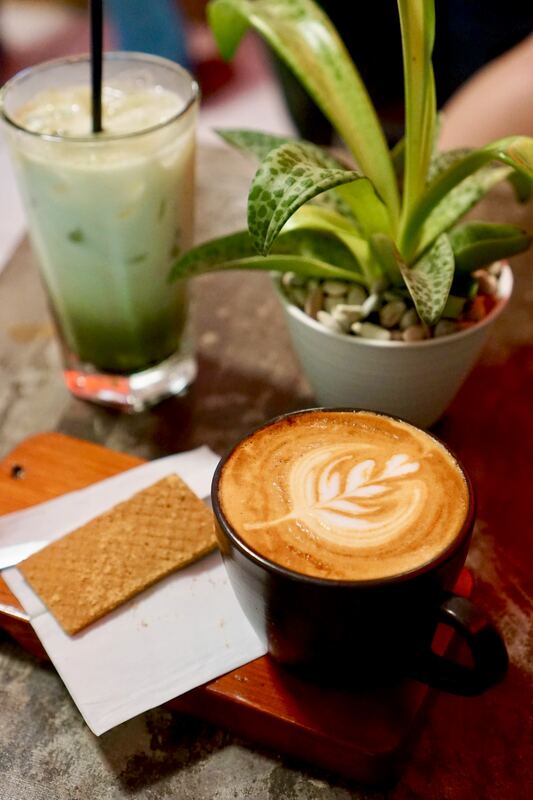 In fact, it’s one of the cheapest cappuccinos made with a real espresso machine in the whole of Bandung. The fitout here is odd. Lots of soft chairs, but also a large concrete bench with no pillows which make it impractical for spending much time on. WiFi here is quite fast at 15mbps down and 8mbps up and there are electricity sockets dotted around the place. If you need a cheap place to work, this is a good one if you can get a soft seat. All in all a decent cheap coffee shop, but the cappuccino needs work. Stick with the iced coffee.